Due to damage of Christchurch Cathedral from 6.3 magnitude earthquake, which struck the Canterbury region of New Zealand in February, efforts have been made to construct a church from cardboard. 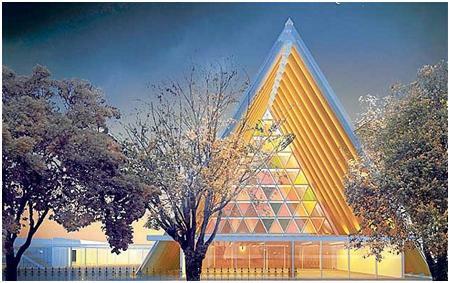 This new cardboard church structure has been made by Tokyo-based architectures, Shigeru Ban Architects and this church will be capable of serving the church community for next ten years at least, told by cathedral staff. Due to earth quake of 22 February in Canterbury region, the spire and part of original Christchurch cathedral tower which was built in 1864 was destroyed. After its destroying, only lower part of the tower is standing behind. This made much dangerous for people to enter in cathedral and church officials agreed to demolish the dangerous portion of its historical church structure, as reported by Wall Street Journal. Its floor plans which were revealed in August by Shigeru Ban, the temporary cathedral of cardboard will be based around 64 locally produced cardboard tubes. These cardboard tubes will provide an A-Frame structure for the cathedral building. The foundation of cathedral will be made from shipping containers, reported by News source of New Zealand. In a question asked from Ban about use of cardboards, a person who has twenty years of experience, told that it is perfect building material. Cardboards are recyclable and strong enough. The strength of a building doesn’t depend about the strength of material used in it, told the Ban. Even buildings which have been developed of concrete are unsafe and will be destroyed with earthquakes. The firm’s buildings are completely weatherproof and fire-resistant and have lasted for more than 20 years, cathedral staff said. When the structures’ working lives are over, they can be easily deconstructed and recycled. Representatives from the city’s Anglican cathedral contacted the Japanese architecture firm in April after seeing its design for a paper church in Kobe, Japan, and the firm has been working with cathedral staff free of charge since May, reports Plastics News. The Kobe installation, which served as an interim replacement for a church that was destroyed in a 1995 earthquake, was dismantled in 2005 and moved to another earthquake-torn community in Taiwan. 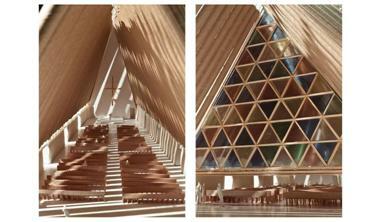 Construction on the cardboard church will begin in January and last approximately three months. The finished structure will cost about $3 million U.S. dollars and seat more than 700 people, cathedral staff said. In addition to performing its main function as a place of worship, the cathedral will also serve as a venue for concerts, art exhibitions, civic services and educational activities.